If your little one is ready to start moving, but has yet to take his first independent step. the Chicco DJ Baby Walker Sea Dreams will have him moving in no time. There comes a point when your baby gets frustrated with lying around all day and playing on the floor. With a household to explore, he just can’t wait to get moving. 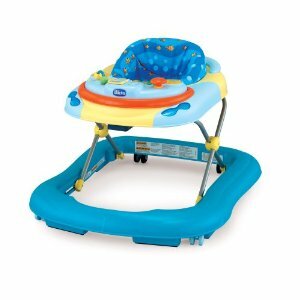 You’ll breathe a sigh of relief knowing that your baby is safely on the move with the adorable Sea Dreams walker. Not only will he be getting some exercise and gaining muscle strength, but he is securely sitting in a walker that won’t tip. He’ll enjoy his new-found freedom and have hours of fun playing with the built-in activity station. He’ll have such a good time playing with all the buttons, lights and sounds that he won’t realize he’s actually learning about cause and effect and developing an appreciation for music and rhythm. Babies are naturally inquisitive and they want to get moving around the house before their little legs are ready to support them. Finding the right walker for your baby can keep him moving and shaking without you having to worry about his safety. The Chicco DJ Baby Walker Sea Dreams is fully equipped for healthy, safe and educational play that will keep your baby happy for hours.